Average babies weigh around 3-4 kg, but this giant girl double the norm! She looked beautiful and was born healthy and with no problems at all! Jasleen was called the heaviest baby every born in Germany. Her weight is little over 6 kg! What causes this baby to grow so large? Most likely it’s the gestational diabetes of her mother. The girl was born naturally and with no complications for her or her mother. Just look at the photo where she is compared to a regular newborn baby! She seems to be a real giant, but she is adorable. However, that’s not the largest child in the world. The real big dude was born in the 19th century in the USA and his weight was over 10 kg! asleen is not the largest baby of them all, but she is quite notable. Hopefully, she grows up to be healthy and happy. The parents surely need to resupply the stock of clothes for such a large newborn. 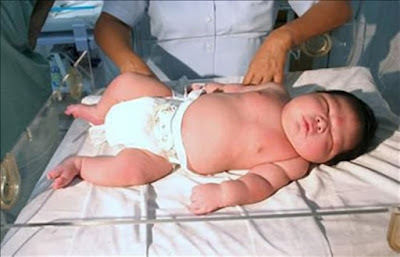 Average babies weigh around 3-4 kg, but this giant girl double the norm! She looked beautiful and was born healthy and with no problems at all! asleen is not the largest baby of them all, but she is quite notable. Hopefully, she grows up to be healthy and happy. The parents surely need to resupply the stock of clothes for such a large newborn.